This is a great way to get your daily dose of caffeine in the summer and best of all it's ice cold. Now, this sounds like an easy step - who needs to learn how to make ice cubes, right? Well today, you'll be adding a little coffee to the usual water. Simply boil the kettle (enough for at least 2 mugs for the later steps) and make up one mug of instant coffee and add a table spoon of sugar if you prefer a sweeter taste. Don't add any milk! Just pour the coffee into an ice cube tray and allow to cool before putting in the freezer and allowing the ice cubes to thoroughly freeze. 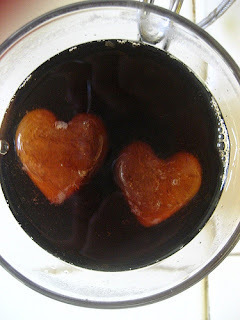 If you're going for extra style used a uniquely shaped ice tray - such as hearts. For my iced coffee I add two heaped tea spoons of instant, one tea spoon of sugar and plenty of milk (or cream), just like I make my regular. Now, wait for it to cool and then set it into the fridge in a lidded container until chilled. Grab a tall glass and add your ice cubes, and give your coffee a little shake until it becomes foamy, now it's ready to be poured on top. You now have the perfect summer pick me up! If you're feeling fancy you can also add some whipped cream and chocolate sprinkles on top to make it extra delicious.